Between minarets and skyscrapers, stone and chrome, lies the fastest growing city in the world: Dubai. Known for its shopping, sand, and sun, Dubai attracts millions of visitors every year, and envelopes them in luxury and efficiency. The city is also steeped in ancient history, yet the old and the new are intertwined implacably, and tradition fits neatly alongside consumerism. Dubai's shopping scene is extremely vibrant, and known the world over. It flourishes and thrives on diversity, from the traditional spice and gold souks, to enormous malls and retail outlets. Everything from electronics to antiques, and designer clothes of all leading Brand of the world to fresh flowers, is available in Dubai's sprawling shopping areas. Everything is duty-free, and most visitors feel obligated verify this claim; and are pleasantly surprised at its veracity. Feel the dynamism of Dubai by exploring the new-age world of breathtaking skyscrapers, gourmet treats and luxury shopping; or the old Dubai of mosques, wind towers, shawarma and souks. There are limitless entertainment options, and you can club all night long to the latest mixes, or experience live Moroccan music and smoke sheesha (water pipes) at cafes. There are plenty of top-notch restaurants in Dubai, and there variety shows you the city's rich cultural mix and diverse population. You can also laze around on Dubai's beaches, or enjoy its world class golf facilities.Any expenses of personal nature viz. tips to driver & Guide, cigarettes, laundry, telephone calls, mini- bar etc. Beverages and drinks at all meal venues [will be charged extra]. Ferrari world park - Adult - $ 85 ! Child - $ 65 ( When on Abu Dabhi tour Transfers extra . International Airport. Meet on arrival & transfer from the airport to Your preferred Hotel, Bur - Dubai, in the city area of Dubai. Evening Free or opt for optional tour. After break fast Later in early afternoon depart for desert safari which includes live performance of belly dance, heena sheesha, camel ride followed by bbq dinner, Overnight at Hotel. 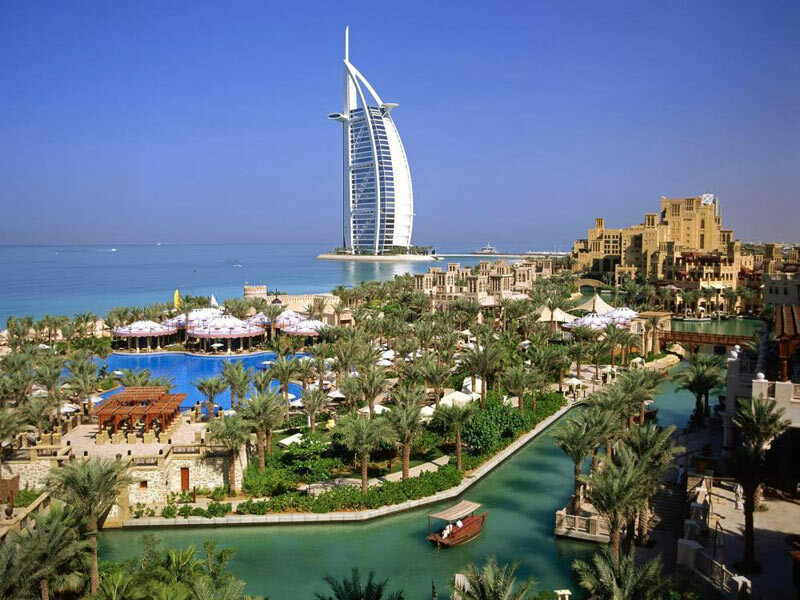 Dubai City Tour Details This tour is a wonderful opportunity to discover the modern and traditional aspects of Dubai. Our excursion starts with the magnificent Burj Al Arab hotel for photos, then onward to jumeirah mosque. On the way to Bastakia, the old part of the city, we pass impressive palaces of the ruling family of Dubai, and the old wind -towered houses (wind towers are a traditional form of air-conditioning). Followed by khalifa tower visit ( ticket Excluded )Nearby, we visit Dubai Museum , in the evening you will be picked up by our local representative for dhow cruise at 0730 Pm. N joy dhow cruise in dubai creek followed by dinner and over night stay. After break fast do last minute shopping & check out of the hotel later as per your flight timings will transfer you to dubai / Sharjah airport with sweet memories of your tour. Booking Conditions: Package is non - refundable - Once Package Book it is non refundable! Visa if rejected on any ground fees is payable & same is non refundable. Any increase in airfare (Fuel Surcharge or any other charge) Valid Passport Copy of 1st & last page with clear Photo. Cancellation Policy: 15 - 8 days: 75% of the total cost 7 - 0 days: 100% cancellation will apply Air ticket + Visa Fee & Service charges are non refundable No refund either in part or in full will be made for any unused part of the services provided in the package Overseas Insurance Policy after issuance is non refundable. Tour Cost 3 Night 4 Days - PP 12499/- * INR. Extension of Per Night with Break fast @ Rs. 1999 INR Per Person.